There’s never a convenient time for an equipment breakdown. Usually, it seems to happen on the coldest or hottest days on Delmarva, when your equipment is working hardest. You suddenly realize your furnace, boiler or central air system is no longer working. But don’t worry, Poore’s is always here to help you restore your comfort. You can count on Poore’s for unsurpassed service and quality workmanship. Our mission is to get you up and running again as quickly and painlessly as possible. Our technicians are knowledgeable, experienced and armed with advanced diagnostic tools, to ensure your problem is identified quickly. Trucks fully stocked with parts and tools reduce the need for trips back to the warehouse. For even more peace of mind, our service plans offer full or partial coverage on parts and labor, and include seasonal maintenance that helps prevent breakdowns and extends the life of your equipment. You’ll also go to the head of the line should you ever need repair service. Our emergency operators are always on call to dispatch service—often around the clock during times of extreme weather. 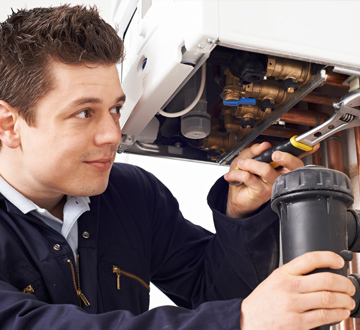 And with decades of experience in repairing heating and air conditioning systems of all models and types, our service technicians are ready for any challenge. If the worst happens and you need to replace your heating or air conditioning system, we can help you there, too, with expert installations for new, high-efficiency systems that can save you a lot of money on your energy bills every year. And if you maintain your equipment properly with the help of an annual Poore’s service plan, your new system should last for many years to come. Whether you need a quick fix or a long-term replacement, Poore’s offers professional, reliable and fast service that will restore heat or air conditioning—and your peace of mind.